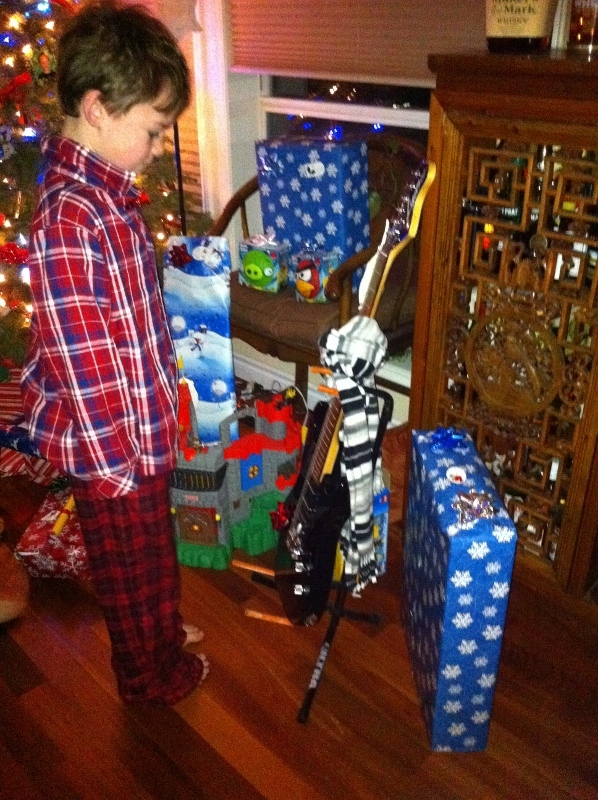 The first look at all the Christmas presents - new electric guitar and Marble Run Maxi - both big items on his list for Santa arrived! 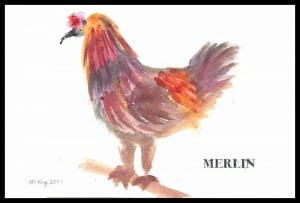 We lost our first hen yesterday to a marauder who took one wing. My farmer friends have voted they think it is a raccoon based on the details I sent them, broad daylight attack, and other forensics which I won’t share. 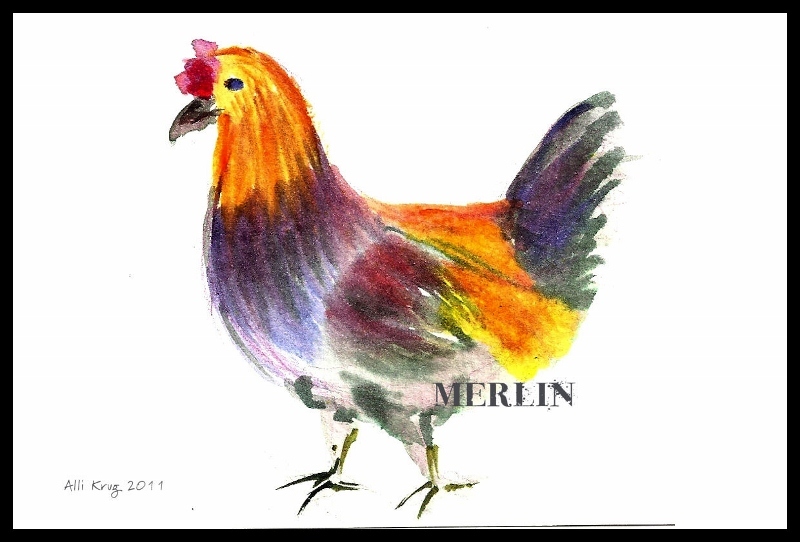 The boys and I came running outside to hear Merlin clucking his alarm call and the hens were all huddled in a corner with him. Sam was the first to notice a hen was missing. 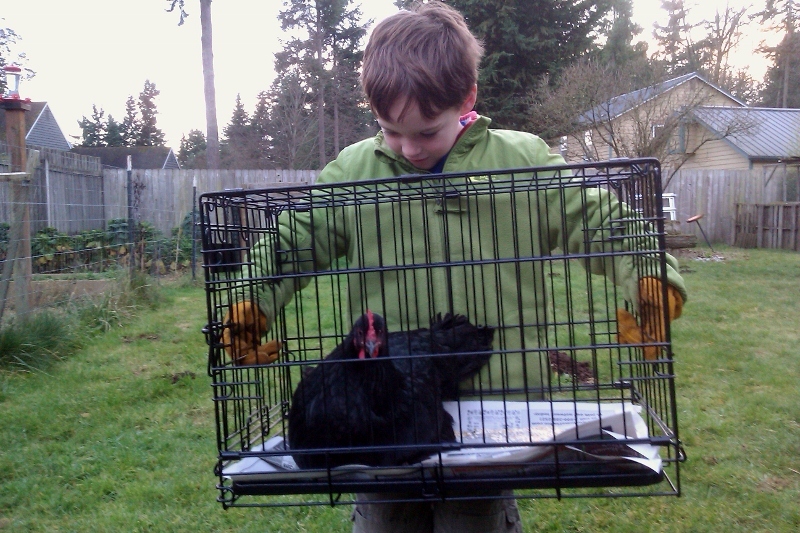 I kept hoping we’d miscounted, but sure enough a Rhode Island Red (RIR) was missing. The one with the little pea comb (small comb) – the sweetest of the three. We looked all over for feathers, or for her. We looked in the woods and on the trails. We couldn’t find anything so we thought it was a hawk. Merlin was looking to the sky as some kind of confirmation. Then just as we got everyone settled in and having a scratch snack, some salmon leftovers and soup (chickens have a good life! ), we went to the truck to run our errands. That’s when I found her – on her side. Poor thing. So we went in to tell Daddy and this morning before church I dug a little grave and put her in her final dust bath. Yesterday the boys and I nailed a little kindling wood cross together and put it by the corner where we found all the hens huddled together – a way to celebrate lives saved vs a life lost. It was just too morbid to mark the hen’s grave. However, we did name her – Polly – so that she would be remembered. Sam took it really hard – he really understood and said it was so sad that Pecky Becky wasn’t the one lost. It was little pea-comb Polly, the sweetest of the three. After lots of talking and empathy, I gently reminded him that she was really one of the “production” birds, not the pet three, but it doesn’t really matter to a kid who had become attached. And I took it hard, too, feeling responsible for allowing the girls to have unsupervised recess. We had gotten a bit lax, I guess, having not seen any evidence of critters in a long time, not even the resident raccoon we knew lived in a tree right nearby. 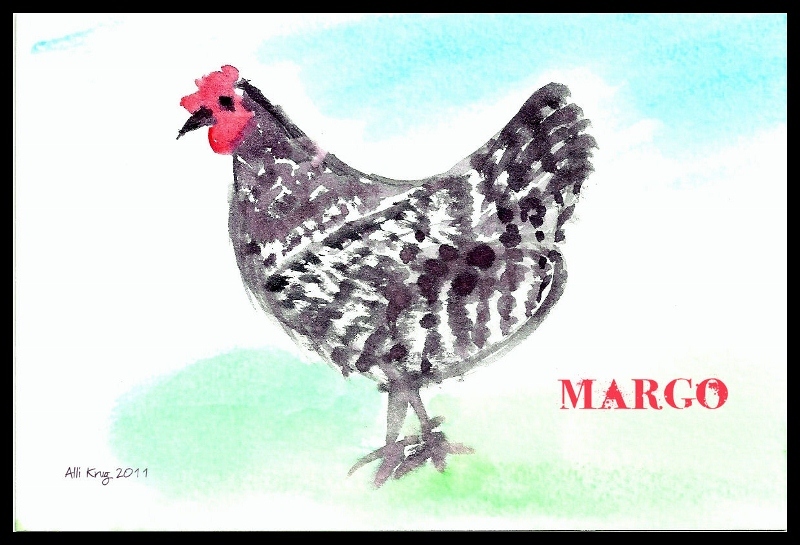 The hens remained under the coop today, growling in a low cluck. They wouldn’t come out to scratch unless one of us came to protect them. We counted hens many times, still unsure of exactly which predator it had been – coyote, raccoon, possum, hawk, eagle, rat – there are so many of them. 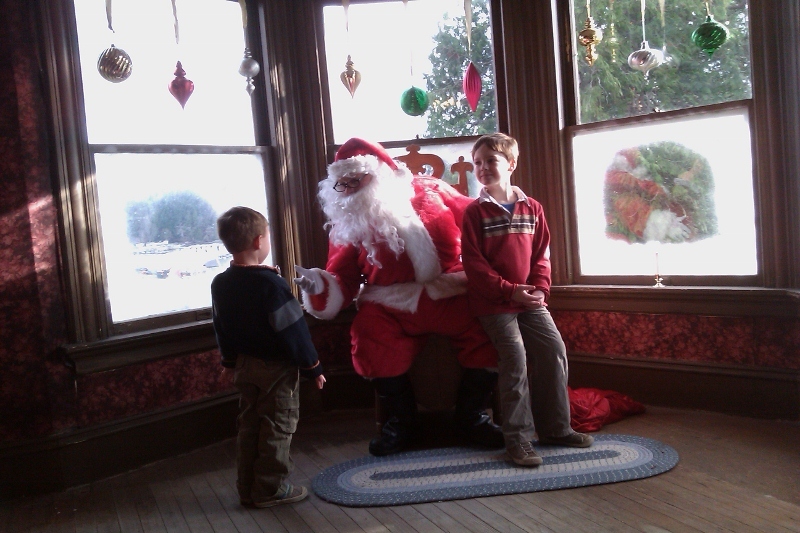 We did get to church, and a visit with Santa today. We’re recovering. But I tell you what – the three of us (boys and me) are eager to avenge Polly’s death. We want at that critter. Sam decided yesterday, though, that God gives us predators to teach us about challenge. And Ben has decided the hen is up in Heaven with new feathers on. Wouldn’t you know, their advent calender treats yesterday were two little rubber chickens – one hen and one rooster – with candied almond eggs. 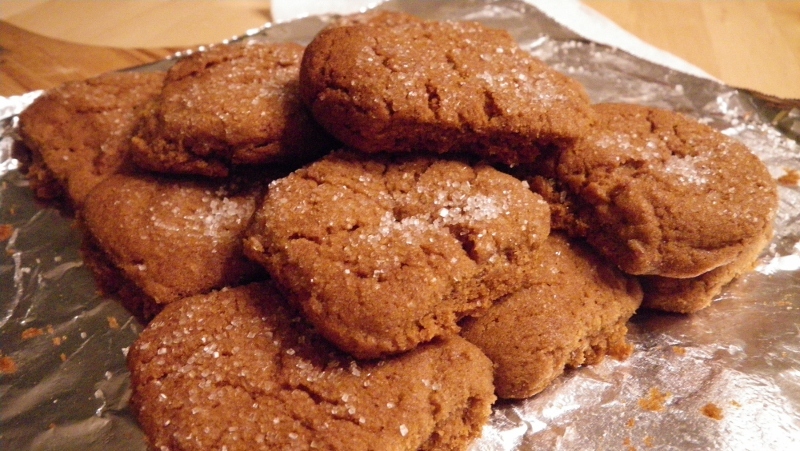 Dave and I thought about swapping out that treat for something else but ultimately decided it was meant to be. Tears were shed aplenty yesterday, but we are strong and will persist. This happens in farm life, however micro the farm is. 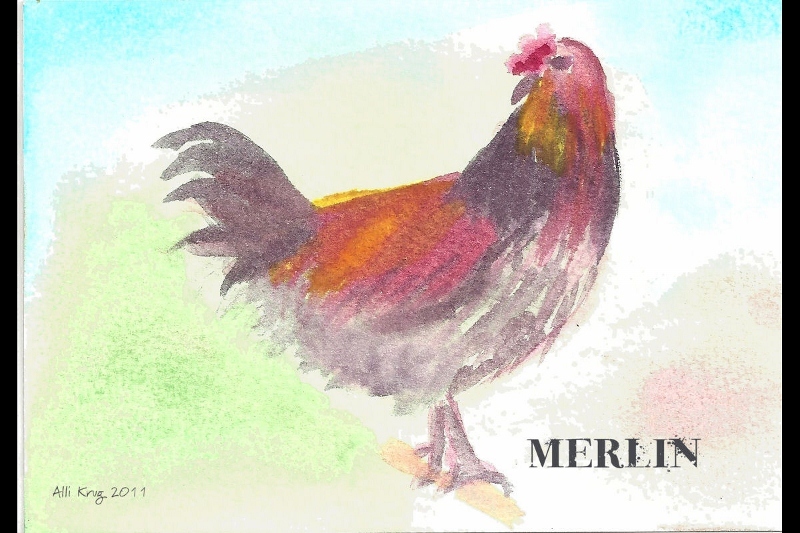 Merlin guarding his hens. He wouldn't crow for 24 hours. SO unlike him. And so very interesting to watch all this unfold. Bless you, Merlin, for your example of manhood! The boys meeting Santa. Ben finally decided he was ok to talk to. Sam had his list all written out for him, one side for Sam, and one for Ben. Sam has been jotting things down for Ben on the back side for a month now. Lest you think I have processed the loss of a hen without too much upset...I avenged her today on the rest of the wood that needed splitting. 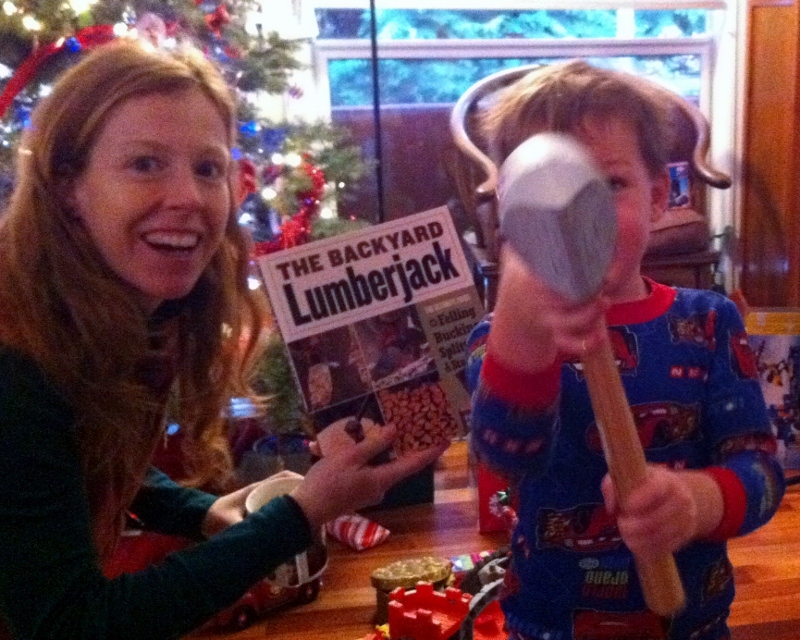 Thanks to Polly, I found enough vengeance to wield the "daddy" axe - the real axe, not the maul - on the wood. I split many of them in one blow, and they sprang about 6ft to each side. Boom! Some of them I had to use a sledgehammer on the back side of the axe, but many I got on first or second swing. So satisfying to finally have that confidence. Thank you, Polly. Know that we are sorry you were lost to that raccoon, and that we are being extra vigilant with your buddies. We missed doing the studio tour today because Dave went in to work, but we kept pretty busy here at the homestead trying to string lights up on a couple 15-20 ft blue spruce trees. Sam was a huge help. My stringing leaves much to be desired at the top of the tree, but I couldn’t reach even with a ladder and an 11 ft pole. 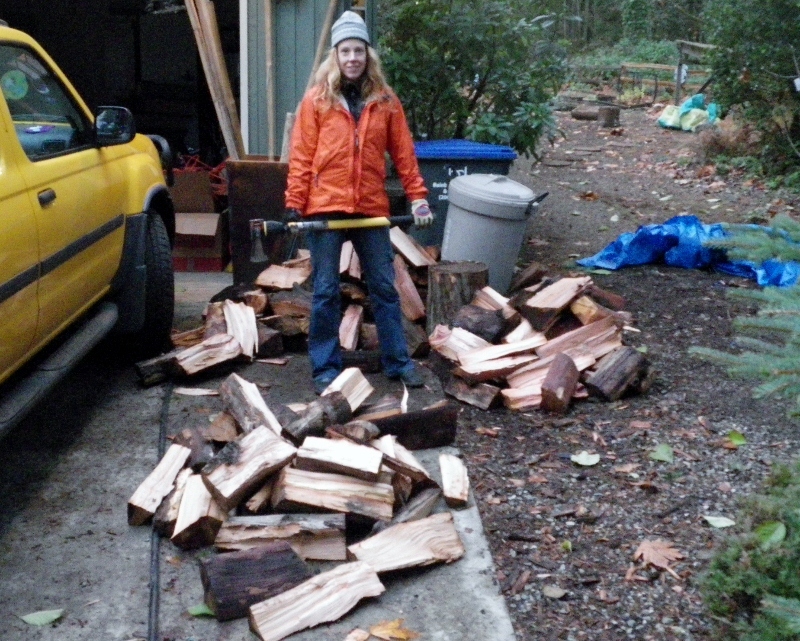 After that fun, Ben insisted on chopping some wood. I actually tried the axe today, not just the mawl, and did pretty well. Then inside for lunch and a little of our own studio time – Sam drew a HUGE Merlin, and I did a few paintings. I made one of a hen that my friend loves very much for her Christmas present. A few samples below…I was wondering when my 2011 painting would emerge. I was a little cranky until I exorcised them! My friend's dear hen, Margo. When she was sick one time she came in to sleep with my friend in the house. The various moods of Merlin, our rooster. 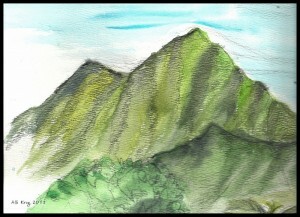 I stood watching him as I painted and several Merlins appeared. This one is frisky. Early-morning 'tude he has here! This is how he looks strutting around the garden, enjoying an afternoon in the sun. 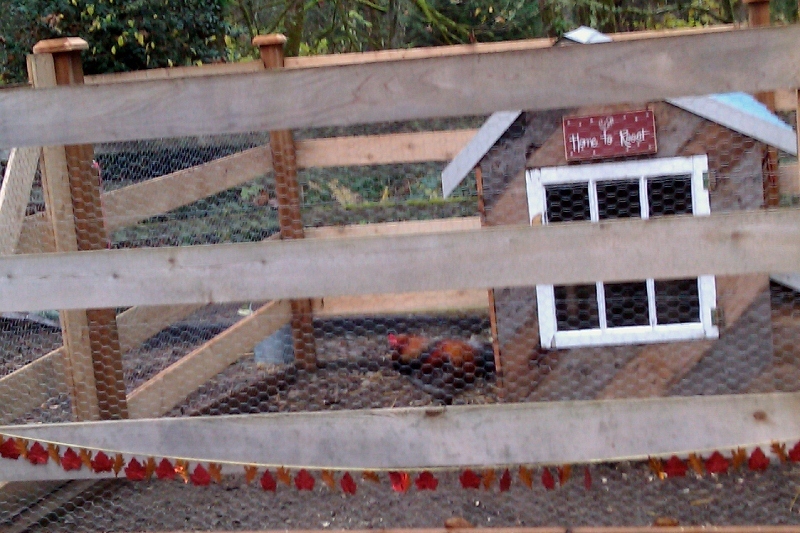 And this is how he looks sitting up on the gate, peering down at all of us before crowing out his greetings. ooooh – quickie biology lesson! Nothing gets me more excited than that! 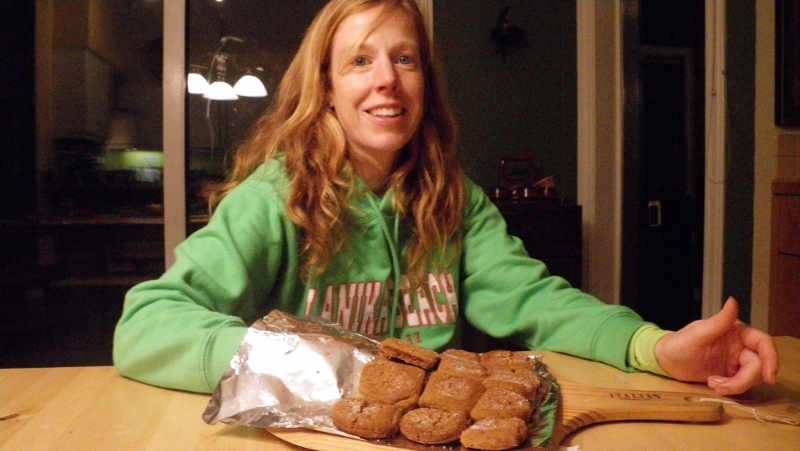 An impromptu lesson as I carried cookies to the table! "Boys! This is like your SKIN!" Skin cells have a signaling mechanism whereby bumping into each other signals full growth, and no further replication by mitosis necessary. So cool! "And this is CANCER." Cell signaling goes awry and they keep replicating, creating a tumor. "Mom, what happens when you get a bump on the head?" Well let's just pretend my arm is a blood vessel - more fluid comes into the area and causes the swelling you see with a bruise. 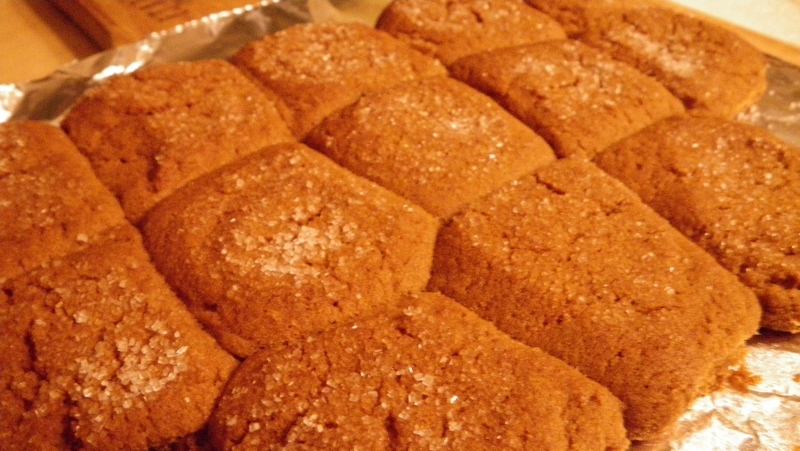 We also talked about a cut - separation between the cookies, then filling back in with new growth.